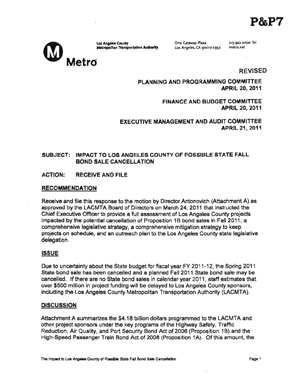 Major road and transit projects such as phase one of the Expo Line, the I-405 Sepulveda Pass Improvements Project and the Orange Line busway extension could lose critical funding if the state fails to sell Prop 1B infrastructure bonds this year, according to a Metro staff report. The problem, in short, is this: still without a budget for the coming year, state lawmakers have canceled Prop 1b bond sales scheduled for this spring and may not sell the bonds in the fall. Los Angeles County is due to receive about $575 million between the two sales, with most of that money paying for construction of big projects. Among other projects due to receive Prop 1B monies are the widening of the 5 freeway between the 605 and the Orange County border, a new high-tech system to prevent train collisions for Metrolink and the replacement of the Gerald Desmond Bridge at the Port of Long Beach. Some quick background: California voters in 2006 approved Prop 1B and several other bond measures as a way to raise money for the financially-crippled state. But the budget situation has only worsened in the time since. This year’s budget deficit is about $15.4 billion. Metro staff are lobbying to ensure the fall bond sales take place. Staff are also drawing up contingency plans should the funding fail to arrive. Los Angeles County could also lose another $96 million in transit funds it expected to receive from a different pool of money — if those funds are taken to plug the deficit. Those dollars are used to help operate Metro’s transit system and support municipal bus lines. If some or all the funds fail to be distributed to L.A. County, it will ultimately be up to the Metro Board of Directors to decide which projects are built and which are not. •Road and transit projects create jobs. •If Metro loses state funds, it could also potentially lose billions of dollars in matching federal funds. •In many ways big and small, mobility is the linchpin of the state’s economy. Goods need to be moved, people have to get to work. As the state’s budget crisis deepens, we expect more media stories about the bond sales and transit funds to appear. The Metro Board of Directors will also be discussing the issue in their meetings scheduled over the next two weeks. Did you really mean phase one of Expo, and not phase 2? It seems so close to being finished. The post is correct. Expo phase I could be impacted. More details are in the staff report. If they lose state funding, then good so this way they can learn how to spend their money wisely instead of wasting it on some things that aren’t needed. So if the state wants to cut the funding then go ahead since it was gonna happen sooner or later. Then if LA Metro faces more budget issues then will be forced to cut more services and projects. If LA Metro ends up doing this then they should cut most bus routes in San Fernando Valley area/Van Nuys area, San Gabireal Valley and East L.A so those areas can create their own bus system like Foothill was created when SCRTD cut most service in Foothill areas back in 1987/1988. I wouldn’t mind if SFV, SGV and East LA Municpal, Private companys and other transit system took over Metro routes there if they cut service. Many people thought Obama was gonna help the economy but it didn’t happen. LA Metro should NOT do the road/free project, it should be responsbility of the city. Plus Metro spending money on lots of stuff, so thats what they get. At issue is STATE budget process. It is a process thing, not funding shortage thing. Why are the attached PDFs so poorly scanned (i.e. fuzzy text and not searchable)? Any way that this blog can get digital copies of such documents? Otherwise, the blog is awesome! You’re right — this is an issue and I’ll put this on the list of things to talk to the tech staff about. I’m not really concerned about redundant road projects like the 405 widening that expands our already built out freeway system which is not going to help traffic anyway, but the possibility of impacts on transit is very worrisome since this is a critical time for building transit and the more it gets put off the less likely it is that it will be built soon or at all (basing on past project plans). If these projects don’t happen soon, mobility in this city is going to come to a complete standstill. How many more people can live in this region and still not have access to modern transit? how much longer can the gridlocked westside sustain itself with rubber-tire-on-asphalt only transportation? Lets hope these bonds get sold. LA needs these transit projects and quite frankly this would not have been a problem if LA got its act together 20+ years ago, but no, things were put off and put off and put off. Picking up where C.G.’s comment leaves off, this could perhaps be an opportunity for the MTA to do some real prioritizing, and consider the long view. And the most crucial component will be a local rail transit alternative – a rail network that allows street-free travel throughout the LA metro area. A true network enables increased mobility, increased density, and county-wide prosperity. Relying on, or even enlarging the current infrastructure of roads, freeways, cars and buses will only bring us more of what we have already witnessed over the past 50 years: congestion, frustration, alienation, noise and expense. This is a great wake up call to start looking at alternative ways so that public transit starts lowering tax burden instead of just “gimme more, gimme more” on federal and state taxes. Move on to distance based fares. If Metro can’t figure it out, hire Japanese transit officials who have the experience and skills to implement this. I think metro is afraid that it would deter people who live further away from their destinations from taking transit. Distance based fares would make sense once LA has an established system that is built out. (if only we had built as much transit as we did with our highways). But right now, image is very important to get ridership and people may complain and say that fares are disproportionately high (even if that’s not true) from further away especially in a still very car-centric culture. But I agree it would help fare box recovery and then there would be more funds for more transit service.